Courtesy of Group Harmony, Robert Mygatt. Refreshed & remodeled completed 1/25/19. Home has fine architecture, massive beams, picture windows, awesome views, circular staircases, 3 FP’s, sauna, & Endless Pool. Spacious studio/office above oversized 3 car garage has large deck, views of barn & panoramic picture windows overlooking pasture, pond, creek and trees. Three lots combined to create a unique 16+ ac parcel w/ 1890 landmark #BattersonBarn, 10 ac sub-irrigated pasture allowing up to 4 horses. See 3D Video and History Video. Driving directions: US 287 N ~17 mi to The forks @ Co Rd 74E/Red Feather Lakes Rd & turn left. Drive ~12.5 mi to Glacier View Meadows Gate 2 & turn right on Mount Moriah Rd. You’ll see Batterson Barn straight ahead, follow to 1st driveway on left. 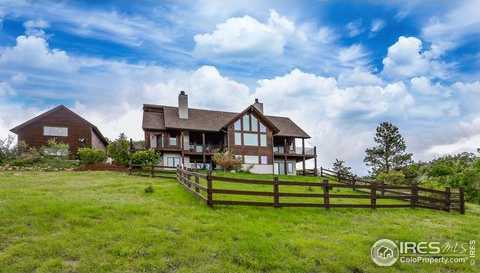 Please, send me more information on this property: MLS# 822029 – $875,000 – 603 Mount Moriah Rd, Livermore, CO 80536. I would like to schedule a showing appointment for this property: MLS# 822029 – $875,000 – 603 Mount Moriah Rd, Livermore, CO 80536.